Before we begin: I accidentally purged my hatontop.com junk mail without reading it this morning (I blame having to get up way too early today), so if you sent me mail yesterday and we haven’t corresponded before, please re-send. Thank you. Mel has posted a few things about watercolor quilts over on Quilts Galore recently, and that made me realize that I’ve never written much here about the quilts I did in that style. Oh, I’ve had a none too sharply focused picture of my watercolor star up as long as I’ve had this journal, but there were a bunch of smaller pieces that led up to that one which I’ve never posted about. Today, I plan to remedy that. First, though, a little background. The terms “watercolor quilt” and “colorwash quilt” are used pretty much interchangeably to describe quilts made from small pieces (usually squares) of multi-hued print fabrics arranged so that the values blend into one another forming an overall design. The technique was pioneered by English quilter Deirdre Amsden in the 1980s and adapted and popularized in the United States by Pat Magaret and Donna Slusser in the 1990s. Amsden uses many subtle Liberty of London prints in her colourwash work as opposed to the brighter, larger scale florals employed by Magaret and Slusser in their watercolor pieces. Amsden’s work also tends to be more geometric and abstract than Magaret & Slusser’s. I don’t remember exactly when and where I first saw the technique. It was either in The Quilt Room: Patchwork and Quilting Workshops (published March, 1993 and not to be confused with The Quilt Room: Dorking, England published in November, 1995), for which Deirdre Amsden wrote a chapter, or In The Beginning, which had an Amsden-inspired project on the cover. I’d never seen anything like those quilts and admired them greatly but the thought of cutting and arranging so many little pieces put me off trying it myself. In 1993, a quilt shop in Toledo (only 45 minutes from where I was working at the time) offered a class based on the Colorwash with Arrows pattern by Lorraine Torrance (the cover quilt from the In The Beginning book). The class fee included a kit with pre-cut squares, so I signed up, figuring that would be a lot easier than picking out 150+ different prints and cutting one little square from each of them. I was wrong. I’m glad I took the class, because it gave me the push I needed to make my first colorwash quilt, but the kit was not as much help as I’d hoped. A lot of the fabrics included were ones that even I, a colorwash novice, knew were less than ideal for the technique, such as tone on tone prints that read as solids. Not blendy. Not good. I ended up using almost none of the prints from the kit, so I did choose and cut up more than 100 prints for this one little quilt. I made a few changes to the pattern, too, shading my background dark-light-dark diagonally rather than dark-light horizontally and omitting the arrow heads and tails which I though disrupted the mood of the design. I finished in August, 1993, and took it to the shop where I’d had the class and the teacher said that the fabrics I’d used were much more interesting than the ones we’d had in class. I took that as a compliment, though now that I reflect upon it maybe it wasn’t meant that way; “interesting” is not always a good thing. Regardless, I was pretty happy with how it turned out and had enjoyed the process–something about getting to play with all those different prints was really appealing. Looking at this quilt now, I see plenty of spots where the blending isn’t ideal, but for a first effort in the technique, I think it’s pretty good. It’s still in the display rotation at my house (I put sleeves on both short sides, so it can hang either end up). Once I knew I could do one of these pretty much on my own, I moved on to other colorwash projects. Magaret & Slusser’s Watercolor Quilts came out in October of 1993; I bought it, but ignored their advice to use 2-inch squares and instead stuck with the 2-1/2 inch ones I’d started with in the first project I’d done. Deirdre Amsden came out with her own book, Colourwash Quilts, in May of 1994 and I bought that, too. For my second quilt in this style, I adapted one of Ms. Amdsen’s works, simplifying it by eliminating one level of framing. I was most proud of the way I did the binding; using one fabric but putting the wrong side out in the lighter half of the quilt. I’m not sure exactly when I finished it; I didn’t write it down and didn’t take but this one picture before I loaned it to a quilt shop owner to take to a show to decorate her booth, during which time it was lost or stolen. I really wish I’d kept better notes of what I did when back then. I know I finished a piece using only leftover squares in March, 1995, only because that’s what the label says. Same for October, 1995’s colorwash bars, which I did do with 2-inch squares for a change. I can only guess that I worked on the ones that are still unfinished in that same mid- to late-90s period: big bars, squares with applique, or split frame. 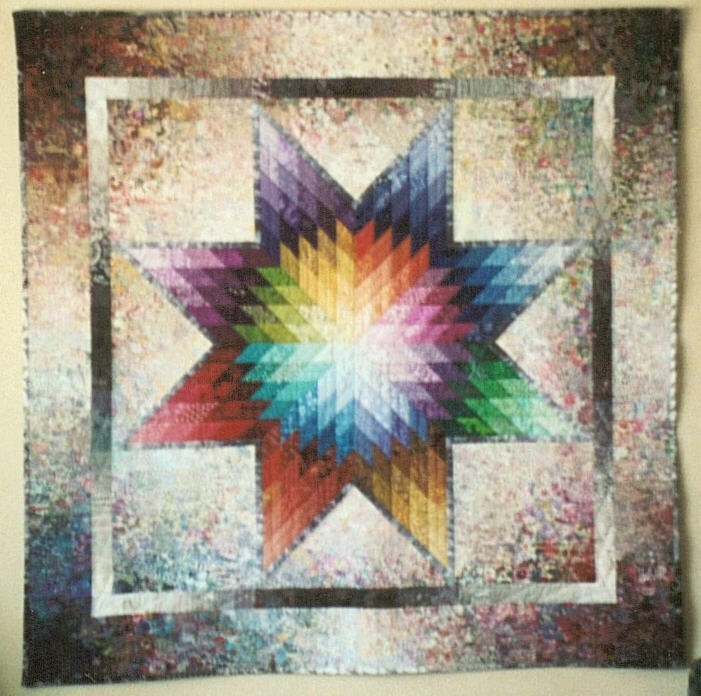 The 1997 AQS Engagement Calendar included a quilt called Colorwash Star by Joann Belling. I liked that quilt so much that I decided to make my own version. Up to this point, I’d only made small colorwashes, no more than about two feet on any side, so what made me think I could tackle something 63 inches square and incorporating a Lone Star in the middle, especially given I’d never worked with diamonds before, I do not know. But I dove in, working on the colorwash background first, and by May of 1998 I had those sections pretty much laid out the way I wanted them, with each corner having a predominate hue. It took months, literally, but I didn’t mind. I had fun hiding pictures in the background: animals and people and buildings and such. Then I started on the Lone Star, which contrasts with the colorwash by using strong hues and prints that mostly read as solids. I was well into when I realized I’d miscalculated and the star was going to be too small for the space it needed to fit in. I had no desire to either cut bigger diamonds for the star or trim down all those squares in the background, so I added an outline of a grey gradated fabric around the star. Except I miscalculated that, too, and ended up cutting off the points of the outline. Like I said, I’d never worked with diamonds before. I finished it in September, 1999, using several gradated prints on the back and a variety of black and white prints for the binding so the edge would blend into the background better than if I’d tried to use one print all the way around. I was very proud of myself, but after I took it to my local quilt shop to show it off, it just hung in my living room until 2001, when I decided to enter it in the National Quilting Association show in Tulsa. I e-mailed Joann Belling to ask her permission since it was based on her design, and she graciously gave it. When Mom and I got to the show, I was amazed to see a ribbon hanging on my quilt–an honorable mention in the Scrap category. Only my second show anywhere ever and I got a ribbon; very cool! I took loads of pictures and kept going back to check that the ribbon was still there–perhaps there was an error? I could see why the category was won by Dee Doebler, with her complicated curved piecing, but how my quilt with its cut off points and wobbly stipple quilting got recognized I wasn’t quite sure. When I got the judge’s comments in the mail with my quilt after the show, I learned that all that time spent getting the squares to blend was well spent, as the first thing listed on the sheet was “wonderful value gradations”. I had to laugh when I read “grey outlining adds a nice touch”, since that outlining was only there because I’d screwed up the math. I could only agree with the comments that my quilting tension and binding joins needed improvement; I was still doing bulky butted corners, not having learned to miter yet. By this point, the watercolor craze had pretty much run its course through the quilting world, and I had pretty much run out of steam on them, but I made one more for a friend who wanted something green and purple to coordinate with her newly renovated house. She’s a good friend, but not so good that I was going to spend months cutting and arranging hundreds of little squares to make her a quilt, so I turned to Deanna Spignola’s book Strip-Pieced Watercolor Magic. Strip-piecing + magic = easy, right? I still ended up cutting a lot of squares, because I wanted to have some idea what the blocks would look like before I put the strip sets together. I started out making a pattern called Valerry, but made so many departures from that it’s hardly recognizable. (It’s number 20 on this page.) This one’s a little smaller than the star, about 53 inches square.